Maria Elizabeta Satellico was born in Venice to Peter Satellico and Lucia Mander on Jan 9, 1706. Together with her parents, she lived in the house of her maternal uncle, who was a priest and who provided moral and cultural training to her. With early intelligence she soon learned to read, showing a particular affinity for prayer, music and singing. The girl had a religious vocation and aspired to be Capuchin, but the Lord had other ideas and she was pointed to the Order in which was consecrated a young teacher of Venetian music and singing, engaged in the monastery of Poor Clares of Ostra Vetere, in the diocese of Senigallia , In March, when she had to leave the convent for health reasons, her place was offered to Elizabeta Satellico, who came to school and carried on the direction of singing and music, at just 14 years. Because of her very young age, the Bishop of Senigallia, did not grant her permission to wear the religious dress of the order, which she could take five years later, at 19; this she did on May 13 1725 with the permission of the new bishop, Castelli Bartholomew, changing her name to Mary Crocifissa. She spent a year of novitiate, in meditation and prayer, meditate on the mystery of the Cross, which she wanted to be more participatory. She professed her religious vows on May 19 1726, before the vicar general of the diocese of Senigallia, and concentrated all her efforts on the realization of her constant desire; become ever more conformed to Jesus Crucified, with the practice of the evangelical counsels and filial devotion to the Virgin Immaculate, in the spirit of Saint Clare of Assisi. 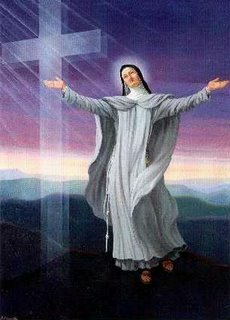 Proven and purified by God with continuing afflictions of spirit and with serious bodily infirmity, she arrived at an extraordinary perfection in the convent, despite continued insults and assaults of demons that tortured for life, mentally and physically. She endured and overcame these trials and tribulations with the help of experts and holy spiritual directors, the child convent Angelo Sandreani and father Giovanni Battista Scaramelli, who would become her first biographer, had the gift of extraordinary supernatural wonders, authentic mystical phenomena, which were no major signs of divine love. She was also elected abbess of the monastery and even when she was re-elected by the nuns, could not continue Bishop’s Office for disposal, assumed the post of Vicar, who drilled onoratamente with kindness and firmness to death, that took, consumed by phthisis, 8 November 1745 at the age of 39 years, was buried in the church of Saint Lucia di Ostra Vetere (province of Ancona) . Following her extraordinary reputation of sanctity, supported also by many graces and favors attributed to her intercession, already seven years after his death, opened the first ordinary process, on August 18 1752, then the difficulties of those times pushed the process aside. It resumed its course in 1826 with Pope Leo XII and in 1914 with Pius X. On 14 May 1991 the miracle attributed to her intercession was approved and October 10 1993, Pope John Paul II proclaimed her blessed. The life of the Blessed Mary Crocifissa Satellico, shines as living testimony to the power of the Cross, which alone redeems, and sanctifies and saves only guarantee peace and love among all children of God. This entry was posted on Saturday, November 8th, 2008 at 2:17 am and is filed under Catholic. You can follow any responses to this entry through the RSS 2.0 feed. You can leave a response, or trackback from your own site.